1939 - A Hungarian Jew by the name of Nicholas Kove set up a business in London manufacturing cheap rubber toys filled with air - the company was named Airfix. 1947 - Airfix manufacturing changed to plastic pocket combs. Kove introduced the first injection moulding machine into Britain. At this time Airfix was the largest comb manufacturer in Britain. 1948 - Airfix was commissioned to produce a promotional toy - the Ferguson Tractor. Their budget was not sufficient to deliver tractors complete - instead the tractor was produced in kit form. 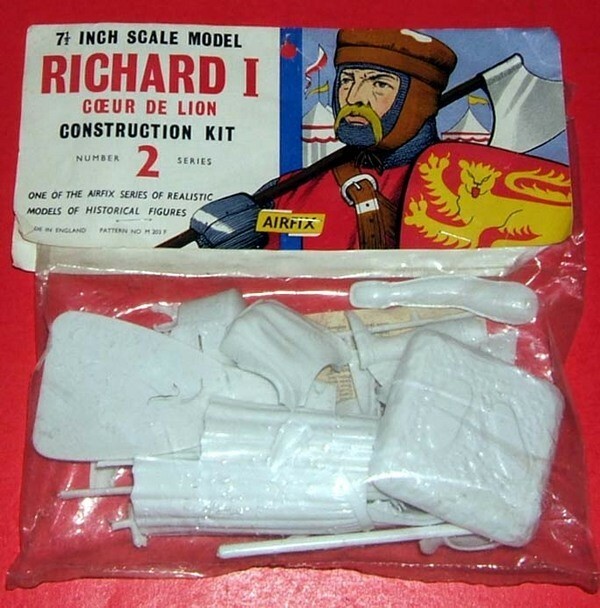 This was the first Airfix kit - 50 were initially made and they sold at 2/11d (that's two shillings and eleven pence - old pre-decimal British money). Arthur Ward in his first book claimed in 1984 that only three were known to exist at that time - a statement that was retracted in his second book in 1999, actually hundreds of thousands of Ferguson Tractors were manufactured over many years. 1949 - Kove hires John Gray as General Manager. Gray was later to lead Airfix through it's boom years. 1952 - Airfix produced their first real construction kit - the Golden Hind. This model was presented to Woolworth in the UK who insisted that it would not sell for anything more than two shillings (2/-), compared with Airfix's proposed price of over twice that amount. The solution was to package the kit in a plastic bag with a simple two-colour header card. The model was an enormous success! 1963 - Airfix begin re-introducing the Kitmaster range of locos and rolling stock. Of the whole Kitmaster range that was acquired, Airfix only re-issued 10 of these kits. 1971 - Airfix expand again by acquiring Meccano from Line Brothers, who had gone bust. Meccano was bought for £2,740,000. The very famous Dinky range of metal die-cast toys was also bought in this year. At this time, Airfix were the foremost British toy manufacturer. 1981 - January 1981 - Airfix goes bust. The kit range was very profitable, but Meccano and Dinky were in deep trouble. Airfix was bought by Palitoy, a part of the American General Mills toy group. Kit production was moved to France. Models started appearing with "Made in France" on the boxes. General Mills also owned MPC and so many MPC kits begin to be marketed under the Airfix logo (especially the MPC range of US car kits). The Managing Director of MRRC (who was the founder) buys the company from the Airfix Receivers. MRRC still exists as an independent company today - based in Jersey. 1984 - Palitoy commission Arthur Ward to produce the Model World of Airfix book. The June 1984 edition of the Airfix Magazine carries a review article of this book. 1985 - Airfix sell the whole railway and trackside ranges to Dapol, except the Airfield Control Tower. The Deltic loco kit passed to Dapol, although it was never issued when owned by Airfix. 1986 - Airfix/Palitoy in trouble again. Airfix are bought out by Humbrol's owners Hobby Products Group (HPG). HPG was itself owned at the time by the American Borden corporation. 2006 - 1st September 2006. The fall of Heller brings down the whole Hobby Products Group. On 30th August 2006, Grant Thorton were appointed administrators of Hobby Products Group, including the trading companies of Airfix and Humbrol. The fall of the group was caused by the earlier collapse of Heller. Airfix moulds are run in the Heller factories in France and without a product supply, Airfix had to cease trading. The administrators announced 31 redundancies out of a total workforce of 41. In addition, a spokesman from Grant Thorton said "the brand names and intellectual property of the business was potentially very valuable" and that he was "lookiing to sell these to a potential investor who may be able to invest in and develop these iconic brands"
2006 - 10th November - BBC news : Hornby snaps up Airfix for £2.6m. Model train maker Hornby is to buy fellow UK collectibles business Airfix for £2.6m ($5m). Hornby will take control of the Airfix model kit company from administrators at Airfix's parent firm Humbrol. Humbrol went into administration in the summer, and the deal also includes the firm's paints and accessories business. Hornby made the announcement as it unveiled a pre-tax profit of £1.4m for the six months to 30 September, down from £2.5m for the same time last year. "We are delighted to have acquired Airfix and Humbrol, both of which are iconic brands in the hobby market" said Hornby chief executive Frank Martin. "The strategic fit with Hornby is excellent." In 2005, the Airfix and Humbrol brands had combined sales of £6.5m. Grant Thornton, Humbrol's administrators, said the deal was in the best interest of the Airfix brand. "This transaction provides the best opportunity to preserve and develop what is an iconic brand" said joint administrator Keith Hinds. Hornby said it will move the distribution, sales and marketing of Humbrol and Airfix to its own site in Kent, and outsource the manufacturing and assembly arm. Humbrol's existing plant in Hull closed when it went into administration with the loss of all jobs but a skeleton crew. 2009 - Airfix intruduce a new 3D logo. 2009 - The very long awaited 1/24th scale Mossie is due for release.